If your family is anything like mine when it comes to the flavor of pumpkin in the form of cookies, then they will LOVE these as much as we do. 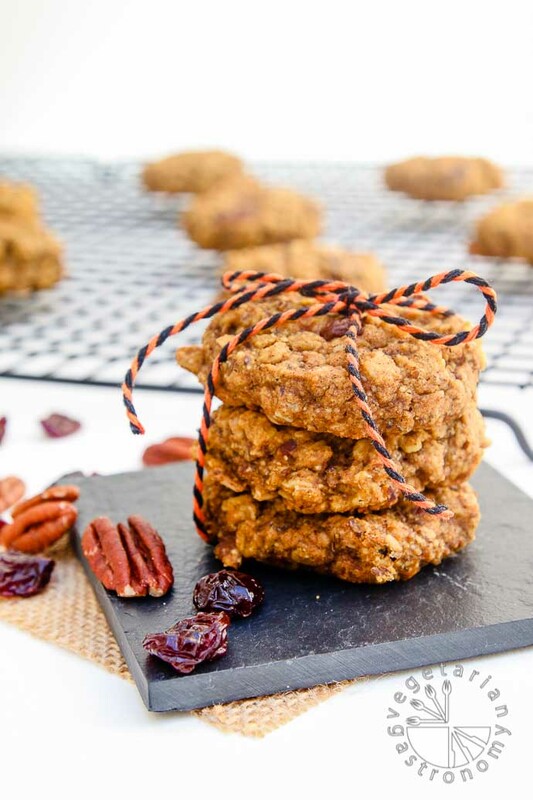 Meet my family’s latest breakfast and snack addiction…my Pumpkin Pecan Breakfast Cookies! Along with Fall comes pumpkin. Pumpkin anything…pumpkin bread, pumpkin cookies, pumpkin decorations, pumpkins to carve, pumpkin pie…you name it, we love it! So when trying to come up with a few fun Fall recipes for all of you, these were at the top of my list. My Blueberry Banana Breakfast Cookies from last year were such a huge hit everywhere, so I knew I had to come up with a Fall version of these lovely healthy breakfast treats. They are vegan, gluten-free, and free of refined sugar. They are similar to my previous breakfast cookies. 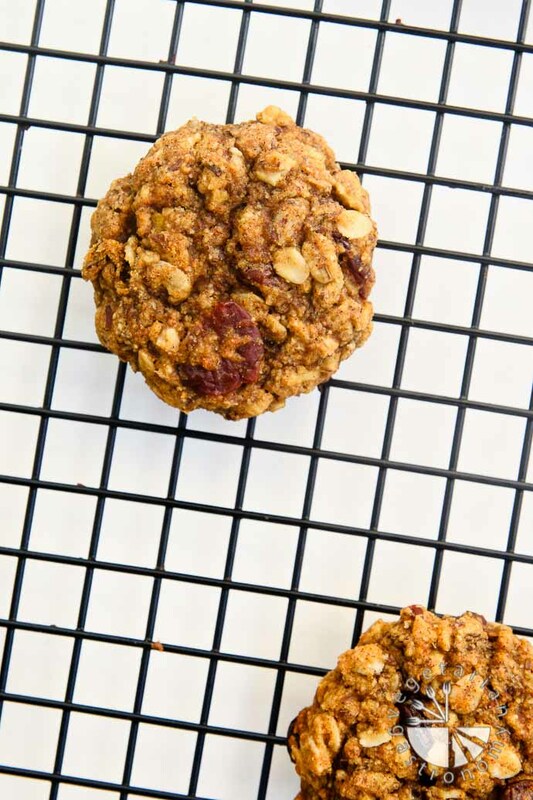 You can think of them as oatmeal, but in the form of a cookie, full of good-for-you ingredients. Since these cookies contain pumpkin instead of bananas, they are much more moist in texture, making them even more irresistible. After 3 trials (each of which was completely devoured by my kids within 24 hours), I turned them into the perfect Fall breakfast cookies! My favorite part about these cookies is that they can be enjoyed throughout the day. Simply grab-and-go for a quick breakfast, enjoy them as an afternoon snack, pack them in your kids school lunches, or even enjoy them for dessert after dinner. So what are you waiting for? Make these cookies! 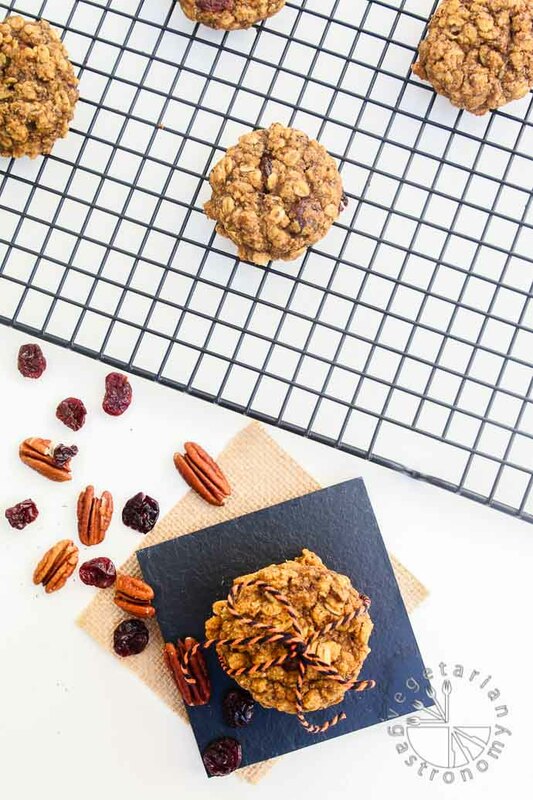 I mean, what better way to start off your Fall mornings than with one (or two or three) of these Pumpkin Pecan Breakfast Cookies! If you do make them, I’d love to hear from you. Leave a comment here below the recipe or take a picture of your cookies and tag me on Instagram or Facebook. It seriously makes my day when see you guys make my creations. Thank you. Happy Fall! The perfect grab-and-go breakfast or snack, after dinner dessert, travel food, or sweet afternoon treat. 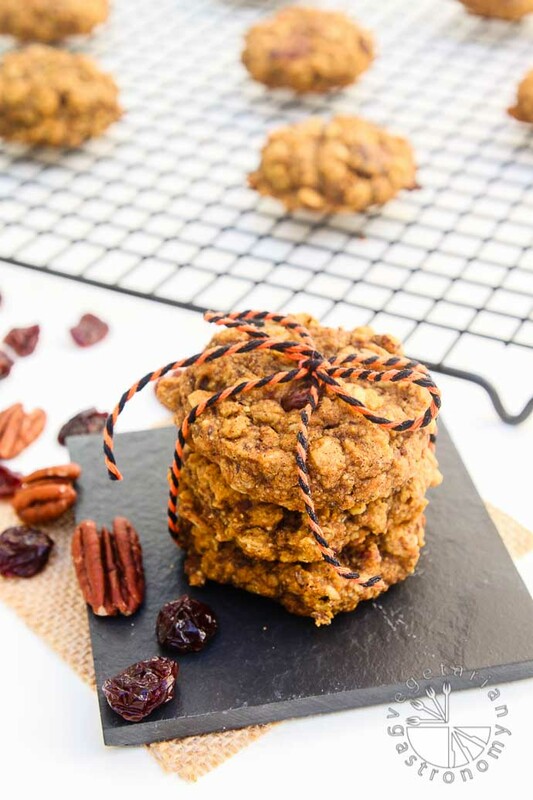 This vegan, gluten-free, healthy cookie is full of fall flavors! In a large mixing bowl, combine all the dry ingredients listed above. Next, add all the wet ingredients into the same bowl and mix until JUST combined (be careful not to over-mix the batter). Add the chopped pecans and dried cranberries. Carefully fold them in and let the batter sit for about 5 minutes while you get the baking sheet ready. Line a cookie sheet with parchment paper . Using a cookie scoop , scoop the dough and release onto the line cookie sheet. Space them about 1-2 in. apart. Then using two fingers, gently press down a little to flatten sightly (the cookies will not spread as they bake). Bake for about 15 minutes, or until the cookies are golden brown around the edges and bottom, and the top is set. Enjoy them for breakfast, as a snack, or for dessert throughout the week! Gluten-free: Make sure the rolled oats you are using are certified gluten-free oats. To make oat flour: Add rolled oats to a food processor and process for 3-4 minutes until very fine. Then measure 1 cup of this oat flour for the recipe above. I typically make a bunch of oat flour at once and store it for use when I need. Be sure NOT to use the instant oats for this recipe. Use whole rolled oats. OMG! These are to DIE for! They look so chewy! YUMMMYYYYYY!!!!!!!!!!!!!!!!!!!!!!!!!!!!!!! They are actually nice and soft, not exactly chewy. It's because of the pumpkin and oat flour, but YES they are so YUMMMMYYYYY!! Wish I could drop some off for you guys from all the batches we made!! Thanks Rashmi! This one is made entirely of oat flour as well, so they are really healthy! 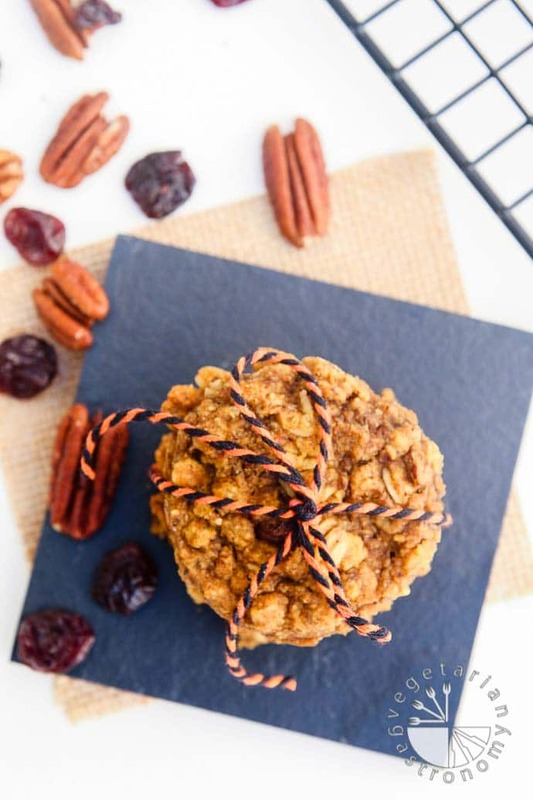 Pretty much oatmeal in the form of a cookie...and with the pumpkin, pecans, and cranberries in there, they are to die for! I was laughing also Mandy when I saw your post this past week! And yes, same thought...I loved that both our recipes are so different, yet are both pumpkin pecan cookies! I'm definitely looking to try your version out soon, they sound delicious as well! Woo hoooooo!! Been waiting for this! I'm so excited for you to try them out! 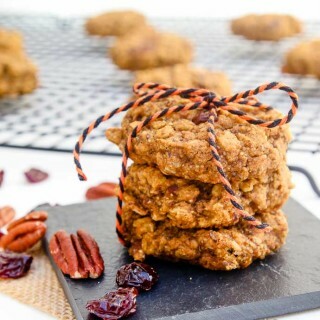 Since V likes the previous breakfast cookies, she will (and you will) love these pumpkin ones! They are really easy to make as well. Let me know when you try them! Tried em. They're DELISH!! Mom actually took half the batch home for dad to eat as dessert! Haha! And from our half, half are left! (This is all in the same day!) keep these cookies comjng! Yum!! YAY! I'm so glad you loved them and were able to make them at home! 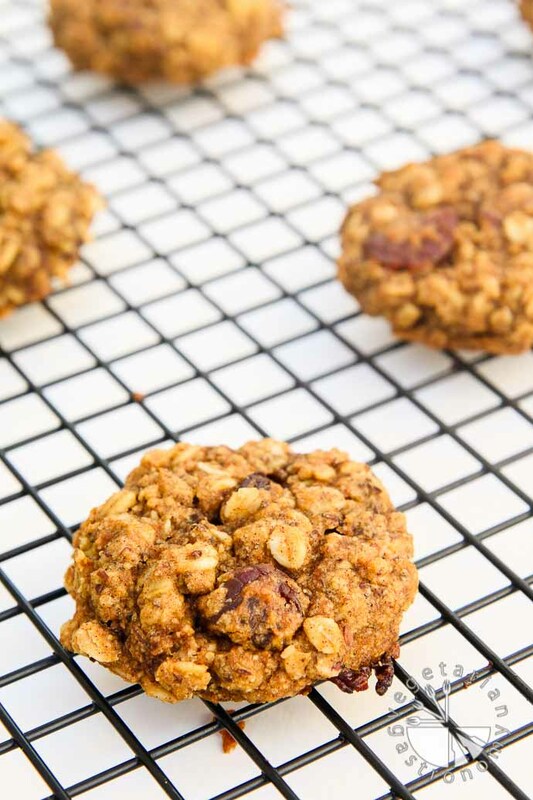 The pumpkin flavor adds so much to these breakfast cookies, that they are our favorite as well! Hoping to create a few other fun flavors in the future. Thanks for making them! Hi !! cld u pl tell me the substitute for maple syrup and how many tsp to use if I can use honey . 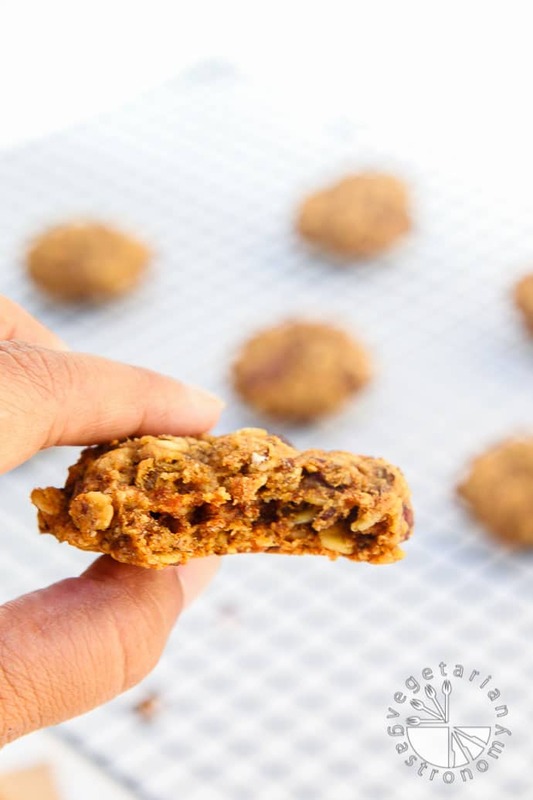 For this recipe, I tried to keep it as healthy as possible so the maple syrup (and apple sauce) adds the sweetness to the cookies. You could probably substitute honey or agave nectar for the maple syrup, just use the same amount 1:1 ratio as a sub to keep the liquid to dry ingredient ratio the same. If you want to add raw sugar instead, it would require a few adjustments of the other ingredients.It may taste slightly different with honey/agave nectar due to taste differences, but should still turn out great! You can also toss in a few mini chocolate chips if you want =) I'm excited for you to try these, they are my kids favorite. Let me know how they turn out with those subs! We made these cookies and boy were they a hit! We love that they are sugar free, dairy free, and gluten free! They are great for grabbing on your way out the door in the morning. You must make these! Thank you so much for making the recipe and tagging me, made my day! I'm already in need of another batch of these! can I make these without the pumpkin spice/puree? I'm not a big pumpkin fan, but these look so good! These are so awesome, too bad you don't like pumpkin =) I developed this recipe using pumpkin puree and made it so I could add as little ingredients as possible to keep them healthy, yet moist and sweet enough. You could try squash puree, sweet potato puree (poke some holes in a sweet potato, wrap in foil, and bake at 400 degrees until soft, then puree with minimal water), applesauce, or mashed bananas. Although I have NOT tried any of these, and only developed these using pumpkin puree, so I couldn't tell you 100% how they will turn out. And as for pumpkin spice, you can just omit it, or add cinnamon instead. You can also toss a few dark chocolate chips in the batter. I also have a Blueberry Breakfast Cookie recipe that is really popular on my site, so maybe try that one? These with the pumpkin puree are much more moist, and a favorite, but the blueberry ones have always been a huge hit as well. Let me know what you end up trying! Hi Anjali, I have been following your blog for a while but first time commenting. Your blog is amazing. It's been my go to place these days. These cookies are awesome. Already made several batches and my 5 year old devoured them. Thank you so much! Thank you SO much for the kind words and commenting on all the recipes you've tried! Really made my day! I love hearing from followers, especially comments on recipes you've tried. Nice to get the feedback. And hearing that it's your go-to place is awesome to hear! Thank you so much! These cookies are a favorite in my house as well, especially this fall! Happy Cooking! I just found out that I am allergic to all dairy & eggs. I tried this recipe for a Ladies' event last night - They were a hit!!! I used golden raisins instead of cranberries (surprise - allergic to them too). It's only day 4 of this new lifestyle but it already looks a little brighter! Thank you!! Hi Kirsten! Sorry to hear about your allergies! But good thing for you, there are tons of awesome recipes that are dairy and egg free! So glad these cookies were a huge it...they go quite quickly in my house whenever we make a batch. I've had an eggless diet for about 15 years now, and have been vegan for about 1 year. It's the best choice I made, and honestly, once you start experimenting with other ingredients, it's actually super easy and you'll find that you won't crave the dairy and eggs at all! Did you check out my latest vegan cucumber ranch dressing recipe? If you need any support, have any questions on your new diet, or need some recommendations of recipes or how to substitute ingredients into your favorite recipes, please don't hesitate to contact me or email me anjali@vegetariangastronomy.com Happy Holidays, and thank you for following! Just made this, they are fantastic! Thanks for a great healthy recipe! Hope D will like them, too! Have you ever frozen dough balls to bake warm as desired? I made those with my 4 year old and they were so easy to make! Everyone in the family loves them, the first batch was gone in no time. Love your recipes - thanks!! Yay you made them! Thank you Hanna, I'm excited that your family loved them! Haha...yes, these cookies go quickly. And since they're healthy I have no problem letting my kids have as many as they want. They're great for breakfast, snack, or dessert, so they tend to disappear fast =) Thanks again for trying out my recipes, following, and the great feedback! Can't wait to try! Love your blueberry banana ones, hoping these will be very similar 😊 I definitely enjoy pumpkin and also gingerbread! Would you be willing to experiment w a healthy gingerbread breakfast cookie or muffin, soft like these and the blueberry ones? Thanks! These are EVEN better! You'll love them. And YES! I'll definitely try to come up with a gingerbread version of these breakfast cookies! It's on my list now! I made these & I they were delish I will make these again for sure !!! The only problem I had was I had to add a whole other cup of oat flour because my batter was way to thin to form cookies on the cookie sheet, other then that I did follow this recipe to a “T” .. I’m not sure what I did wrong that made the batter too thin, has this happen to anyone yet making these cookies? Please let me know. Hi I made a second batch (& doubled it this time haha)just today & turned out perfect. I noticed that as I let the batter set it thickened up just perfectly. I think last time I didn’t let it set to long , I am so happy I didn’t have the same problem this time around(-; I also added some grated carrots & are so so yum. So great to hear!!! When I try the recipe out again next time, I'll make a note of that and see if that's a requirement so i can add it to the instructions. Thanks so much for letting me know! The carrots sound like the perfect addition! OMG I recommend you bake these in the mini muffin tins too , I made these in cookie & mini muffins & to my surprise I loved the muffins better ! I just had 4 of these little baby’s for breakfast, & they are ‘oh so satisfying... I’m soooooo glad I stumbled upon this recipe , Thank You! Will try that next time! I've only made them in cookie form :) I also have a blueberry banana version of these cookies on the blog if you're looking to change it up, and am working on a new favor as we speak. But the pumpkin is my current favorite as well! Thank you! so glad you loved them! I will definitely check that blueberry banana one out & looking forward to your next recipe! Is there something that can be substituted for the oil? Maybe more apple sauce? Yes! Although i haven't tried it without the coconut oil, it's 6 tbsp...so you could probably easily sub with more apple sauce. The texture may be slightly different but i still think it'll turn out great!